I can hardly think of any occasion where I have laughed so hard while watching Shakespeare. Sitting on a bin-liner, itself on a damp patch of grass, I was watching The Pantaloons present Cymbeline, the Bard’s seldom seen tale of a boastful wager of honour that goes terribly wrong. Including common Shakespearian themes such as chance encounters, mistaken identity and good old-fashioned cross-dressing, the story basically revolves around a Roman noble, Iachimo, who makes a bet with Posthumus – the banished son-in-law of King Cymbeline – that he could charm the pants off any girl, including Posthumus’ wife, Imogen, daughter of the King. Needless to say this doesn’t quite work out in a straightforward manner, otherwised there wouldn’t be much of a play. The real good bit of Cymbeline is the final scene, where each character comes forward, Scooby Doo style, to reveal their part in a very complex jigsaw. Cymbeline itself isn’t Shakespeare’s greatest work, but the tremendous treatment given to it by The Pantaloons positively makes it sing. And talking of song, the whole story is accompanied by madcap minstrel, Dom Conway, who maintained an energy throughout the show that has to be seen to be appreciated. So, you’ll have figured out by now that this production isn’t exactly Cymbeline done straight. If I reveal that part of the story appears as Punch & Judy, and one of the props is a Tigger soft-toy with a pole through its middle, you’ll get a general feel for the style. Any sense of the fourth wall is obliterated as the audience is constantly engaged by the actors in a pacey, contemporary and occasionally improvised view of Shakespeare’s fairy tale. Needless to say, the ridiculously talented cast play many roles – indeed they get to certain points where the script calls for more characters on stage than there are actors. But this is comically handled with the aid of hats and twigs, and, well, just about anything they can lay their hand on. Tom & Dave Hughes engage in running gags, slipping between character and real person to parody the pretentiousness of theatre. This was like watching Terry Pratchett add footnotes to the Bard’s greatest speeches. 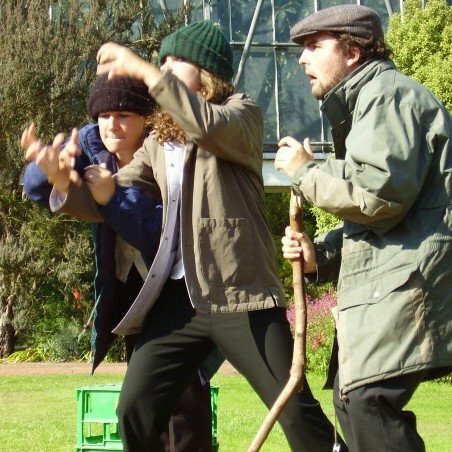 Facing numerous distractions – not least of which was the highly indecisive Edinburgh climate – and the severe lack of the usual theatrical technology to paper over cracks, this team held the majority of the audience for the full 2 hours. A considerable achievement given we were sitting on bin-liners, on a damp patch of grass.